Clay Aiken – Does The Cat Eat Green Eggs? On this day in 1904, Theodor Geisel, better known to the world as Dr. Seuss, the author and illustrator of such beloved children’s books as “The Cat in the Hat” and “Green Eggs and Ham,” was born in Springfield, Massachusetts. Geisel, who used his middle name(which was also his mother’s maiden name) as his pen name, wrote 48 books, including some for adults. He has sold well over 200 million copies of his books and they have been translated into multiple languages. The National Education Association annually sponsors Read Across America. Now in its sixteenth year, the program focuses on motivating children to read, in addition to helping them master basic skills. The nationwide reading celebration takes place each year on or near March 2, the birthday of Dr. Seuss. Across the country, thousands of schools, libraries, community centers, and more participate by bringing together kids and books. 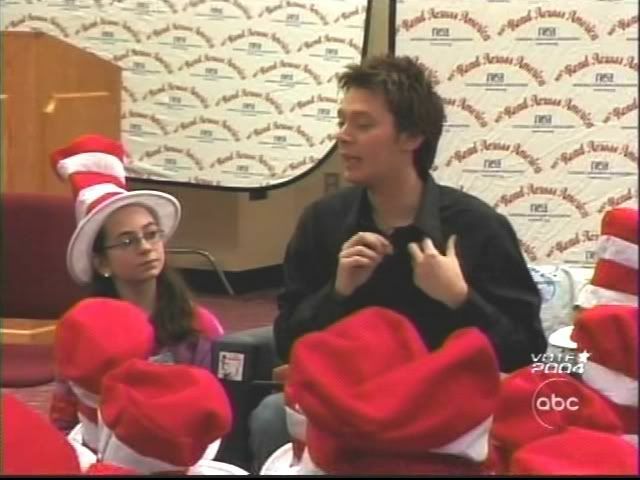 In 2004, Clay Aiken participated in Read Across America. He visited a elementary school, donned a red and white Dr. Seuss hat and read to a lucky classroom of students. 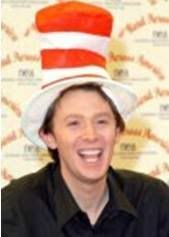 Congratulations to the National Education Association for sponsoring such an important day and a big thank you to all the celebrities like Clay Aiken, who support the importance of reading for all. If Clay had not entered the entertainment industry, his ability to teach would have been just as phenomenal as his singing. He is an exceptionally talented man in so many ways! "Cat In The Hat" hat! We had one of those hats at our house, too – too bad Clay wasn't in it!!! I love that Clay participates in so many worthy causes. What a guy! One of the reasons I love Clay so much is all he has done fur so many children around the world,On CA he reminded me of my speech therapist.I dont care how many times you say no YOU ARE AN ANGEL FROM GOD CLAY!! !.And the fact that Roma Downey is your friend proves it! Error: Error validating access token: Session has expired on Tuesday, 21-Aug-18 16:13:01 PDT. The current time is Wednesday, 24-Apr-19 02:17:57 PDT.